Tenju (sometimes spelled Tenjyu) means “Heavens Tree”. It is a giant, semi-intelligent tree on Jurai which houses the Royal Palace as well as all of the Royal Trees. However, Tenju is not a Royal Tree but it was created from Tsunami. Roughly 150,000 years ago, the man who would become Jurai’s first emperor met Tsunami who was in a giant, humanoid form. After promising to protect him and his descendants, Tsunami turned the giant body of herself into the giant tree Tenju. Who is this Mitsuki I keep hearing about? Her full name is Amaki Mitsuki. Her grandfather was the Emperor of Jurai before Azusa. Her mother is Juraian but her father was a from outside Jurai. In fact, he was a spy, sent by one of the pirate guilds. As a child, Mitsuki discovered that she could synchronize with Tenju. As such, Mitsuki knew everything that went on within Tenju. Her father discovered this and used her to aid his spying. Since she wanted to please her father, Mitsuki had no qualms about doing this. When a neighboring system was attacked by a large, well-informed pirate force, Seto-sama quickly discovered the how they got their intelligence. Mitsuki would have been banished from Jurai, but it was discovered that she was only alive because she was being supported by FIVE 1st-generation trees! To leave Jurai would mean the girl’s death, so a special room was created for her and only the Emperor was allowed to see her. Azusa’s uncle (his mother’s brother) took the fall for the pirate attack and was banished instead to allow Jurai to save face. Azusa’s parents were also banished from Jurai. Years later when a young Azusa was brought back to head House Masaki, Mitsuki spotted him. She eventually arranged for a transporter accident so that Azusa wound up in her room. Azusa fell in love with her and she with him (despite the age difference). Their secret meetings were soon discovered by the head of House Amaki, Shuzan, and he confronted the pair in Mitsuki’s room. He attempted to use Azusa’s forbidden meetings with Mitsuki to have Azusa punished and to further his ambition to be next Emperor, but Seto-sama intervened by telling Shuzan that he would suffer the same punishment as Azusa for also meeting with Mitsuki (when he confronted her and Azusa). Shuzan decided not to pursue the matter. The next day, a tree ceremony for Azusa was held with Seto-sama, the Emperor, Kotono (head of House Tatsuki), and Mitsuki present. There was great surprise as Azusa was not partnered with any 3rd- or 2nd-generation trees. As such, Azusa was allowed to proceed to the floor where the 1st-generation trees resided. Only Mitsuki followed him here. She told him everything, then told him to take her as yet unnamed tree. He protested saying he it was hers and that he couldn’t hear the tree’s voice. She told him he was hearing the trees voice even now and revealed that her right eye was in fact made from the sap of the tree and thus the key to the tree. She cut herself off from the support of the 1st-generation trees and reminded Azusa of his promise to show her the outside world. He re-promised and she died as she began to tell him she loved him. Azusa placed Mitsuki into the royal tree’s uro (a room/hole in the tree, seen in OAV episode 2 where Tenchi and Sasami jumped into or from where Aeka came out in the beginning of the episode) where a small crystal pond of sap lay. Azusa placed Mitsuki into this small pond where she is preserved to this day. Azusa then named the tree Kirito (Fog Sealing) after a story Mitsuki had told him. Where do the royal trees get their power? All of the royal trees obtain their power via subspace from the original tree Tsunami, which contains all of Tsunami’s Choushin powers. Tsunami’s tree offspring are known as 1st-generation trees. The 1st-generation tree’s offspring are known as 2nd-generation trees. 2nd-generation trees produce 3rd-generation trees and 3rd-generation tree’s produce 4th-generation trees. I have no information of tree’s beyond the 4th generation. 1st- and 2nd-generation trees have the ability to generate Light Hawk Wings, a manifestation of the Choushin power which are used primarily for defense. 3rd- and 4th-generation trees cannot produce Light Hawk Wings on their own, but can combine their powers to produce them. How powerful are the royal trees and Jurai powers in general? What are the greatest feats of power? A single 4th- or 5th-generation ship is more than a match for any vessel that any other space-faring nation can build. 6th- and 7th-generation Royal Trees can power a colony by themselves. It takes a big power supply equal to that of a star to overwhelm a light-hawk wing. How do the tree-ships work? The royal trees are sentient beings. As such, they choose whom they will partner with (and there is a ceremony for this). Once a tree is partnered, a ship is then constructed which can access the tree’s power. The tree is placed into a core-container and container is inserted into the newly constructed ship. The tree creates a subspace region and designs the environment to suit the tastes of the partner (the living quarters). Thus far, these have all resembled a planet’s surface (most likely Jurai’s). Those seen have had a single, giant tree (20 or more stories high) at the subspace region’s center, but this may not be true for all tree-ship’s living quarters. To enable better synchronization the connection between the partner and the tree, a key is made from a branch of the tree. So each tree has a key which is kept by the partner. The shape of the key is dependant on the branch used and the taste of the partner. 1st-generation tree’s keys are “master keys” which can take control over 2nd-generation trees and higher in cases of emergency. What happens to a Royal Tree that loses its master for some reason (the master’s lifespan, accidents, etc.)? From K-sensei: After the death of its master, in most circumstances, the tree is planted to serve as both grave marker and gravekeeper. How many Royal trees are there? How many are in ships? The exact number of of trees is unknown to us. The royal arboretum on Jurai contained a large number of royal trees (as seen in the flashback sequence in episode 9). For more information on Royal Trees, read this article. Why isn’t Tenchi bonded with a tree? Because there is no need for him to bond with a tree. He has his own powers and is superior to any tree on Jurai including Tsunami. Can Tenchi live for hundreds of years too like his grandfather Yosho? A lot more than that! Remember, Tenchi has his own powers to keep him alive for a very long time, like Tsunami and Washu. What is the average lifespan of a Juraian? A member of the Royal Family can live thousands of years. With Washu’s technology, this can be much higher. For example: Misaki and Tenchi will still be around for hundreds of thousands of years. A normal Juraian has the same lifespan as a human, though the superior medical technology ensures a healthy and long life. Naturally, life extensions and body reinforcement will prolong this and is available to members of Jurai’s military as well as those that attend the Galaxy Academy, particularly the Galaxy Police Academy. Long lifespans is not that uncommon in the galaxy, but it depends upon the race’s technology level and the individual’s power and wealth. Living over 10,000 years is not impossible for someone with the means to get the necessary treatments. Do Juraians need the waters of life for their longevity or is it innate? The waters of life are used to heal injuries when advanced medical technology is not available. The actual source of longevity comes from life-extension coupled with body reinforcement (which makes life-extension permanent/multiplies their effect). What are the houses of Jurai? There are four royal houses on Jurai. Masaki: This is the house of the current Emperor, Azusa. Aeka, Sasami-chan, Yosho, and Tenchi are all members of this house. Kamiki: This is the house of the infamous Seto-sama, mother of Misaki and grandmother to Aeka and Sasami-chan. Amaki: This house has yet to appear in anime form. However, its current head, Shuuzan (Syuuzan) has played an important role as he had attempted to thwart Azusa from becoming Emperor on two occasions and attempting to kill Funaho in a dual. Tatsuki: Very little is know about this House. A page in the 21st Century doujinshi is dedicated to them, but it doesn’t tell a whole lot. How are the heads of the Royal Houses chosen? The head of the house is believed to be chosen by the previous head of the house with blood being the choice if a successor was not named prior to death (how Azusa became head). If equal claims are present, it probably comes down to support by senior members of the clan. Thus, it more likely reflects Japanese clan structure. Can one be both monarch and a head of a house (clan)? No. As a matter of fact, Funaho became the head of House Masaki once Azusa took the throne as emperor. Who makes up the Supreme Council of Jurai? Currently, Emperor Azusa, Queen Funaho, Queen Misaki, and Seto-sama. How are rulers chosen on Jurai? Via election from the four royal houses. Before Azusa was elected emperor, the previous emperor was from House Amaki. When he died, the heads of the four royal houses come together to choose a new emperor. Various factors (including normal politics) go into whom is elected, but having a 1st-gen tree as a partner all but assures your election since only five (not counting the 1st-gen seed that bonded with Seina) have chosen to bond with Juraians. If that’s the case, then why is Tenchi called a Crown Prince in OAV 1? Actually, the real issue is very simple… there’s no “crown prince” mentioned in the original Japanese OVAs. Pioneer took some liberties (or made a mistake) and translated “dai ichi ouji” (“number 1 prince”, or “first prince”) as “crown prince” (outaishi). They even changed “prince” (ouji) to “crown prince” in episode five, when Youshou reveals that Tenchi is a prince of Jurai’s Royal Family. The crown prince (or princess) would simply be the elected successor while the current emperor is still ruling. The position is not inherited, but gained through election. I guess it is akin to being president-elect. It was possible that there might be electorial pressure to pit Youshou against Aeka in the election to choose the successor to Azusa (when the time came). This was the issue that Youshou was using as an excuse. Youshou ran away before there was an election. Realistically, Aeka could have stepped aside (as Sasami/Tsunami will do for Tenchi) if it came down to it, but politics is a really sticky problem and it was Youshou’s best excuse for running away from Jurai and his engagement to Aeka. The real reason, his love for Airi, would not have been the best reason to give at the moment. Even his old love for Misaki, would not have been a suitable excuse. His tertiary reason, the fact that he loved Aeka as a sister, would have only been reason enough to not marry Aeka. It would not have justified his running away. Why would they pit Yosho against Aeka when they were to be married and members of the same Royal House? Does that mean they would pit Sasami against Tenchi? Aeka was confused as well. Ultimately, it has to do with the fact that Youshou would never have married Aeka. Ryouko’s attack afforded him the opportunity to avoid having to face his parents and to run away from his problems. Without the connection by marriage, political issues could very well drive them against each other. Certainly, his decision to not marry Aeka would have, at that time, caused significant turmoil within House Masaki. Of course, now that Youshou has a suitable heir, he can now have everything that he wanted while avoiding any consequences. The heat’s now on Tenchi, not Youshou. Wait! Isn’t Yosho next in line to the throne? If that’s the case, was he already elected? Yosho is next in line to the throne by virtue of the fact that he too was bonded with a 1st-gen tree (Funaho-ki). So if his father Azusa steps down or dies, Yosho’s election to the throne is all but assured should he return to Jurai with Funaho-ki. What are Seto-sama’s Thirteen Divine Admirals doing most of the time? Also, with the exception of Kanemitsu, has there been anything established about the remaining (twelve?) admirals? Some of them are in informal [? temporary?] retirement, while others are missing after being married off to foreign worlds, using military training as an excuse to play around, or on maternity leave. Seto-sama’s husband, Utsutsumi (13th Holy Defense Fleet). HIRATA Kanemitsu (7th Holy Defense Fleet) – it’s very likely that he’s serving as a substitute until his wife returns from maternity leave. The rest of them are kind of… a secret. “Choushin” refers to the three most powerful deities in the universe: Tsunami-sama, Tokimi-sama, and Washu-sama. Kajishima-sensei says that Tokimi is currently the most powerful. This is because she controls the power of the Choushin and can cut Tsunami and Washu off, preventing them from acting (as seen in episode 19 of TM!R). Are the Choushin sisters? If so, who’s the oldest and who’s the youngest? Yes. Washu is the oldest followed by Tsunami and Tokimi. Tokimi refers to Washu and Tsunami as “neesan”, which is how a sibling in Japan would refer to their older sister. Also, Washu has three dots on her forehead as the oldest, Tsunami has two and Tokimi presumably has one. What is the purpose of the Choushin? Ultimately, to find Tenchi (click here for what else was revealed in episode 19). Kajishima-sensei did have some stuff to say on the matter in the Shin Perfect Collection art book (which is a Tenchi in Tokyo artbook, but Kajishima-sensei did answer questions in it as well as post three new art images from TM!R). The three Goddesses share a certain common purpose. As means for the purpose, Washu and Tsunami let themselves exist in several dimensions and Tokimi overlooks subordinate dimensions from the summit. I: Is it also a means for their purpose that Sasami is assimilated with Tsunami? I: How about Mihoshi’s extreme luck? K: It’s also one of the result of the purpose. The Goddesses were imprinted a certain purpose in their consciousness when they were born, and they created the universe to achieve the purpose. I: Is the purpose the cause of the tumults in Tenchi family? K: No, not at all of the tumults themselves, but Tenchi himself is one of results of the purpose and so is ‘Z’. I: The reason why Washu stays in Masaki family is for the purpose, right? K: It’s one of the reasons but it’s due to fate mainly. K: As a proverb says, ‘there are no accidental meetings’. She doesn’t know why she has come to Masaki family but she has. She thinks it’s not so bad and she is comfortable to being there. I: It doesn’t have to mean she loves Tenchi, does it? K: She does. She has the same feeling for Tenchi as Ryoko does. Because she has been astral-linked with Ryoko. 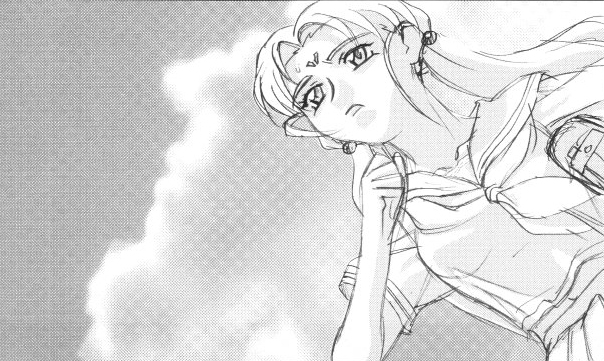 Her mind was synchronized with Ryoko completely during she had been sealed in Souja. Being the seal broken, her ego was come back to her. 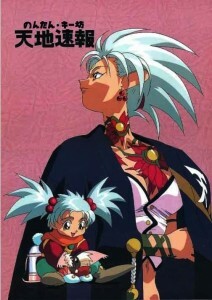 But the experience during Ryoko had kept her eyes on Tenchi for more than a decade took root in her mind. Thanks to S.Naoe for the translation and Oni Shin for archiving the information (I fixed spelling errors). Who is the most powerful Choushin — Tokimi, Washu, or Tsunami? In an interview, Kajishima was asked who the most powerful Choushin was. He stated that it was currently Tokimi. 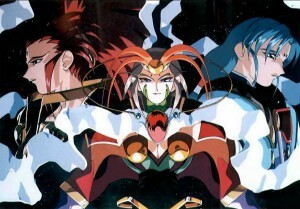 In OVA 3, it is revealed that Tokimi was in charge of limiting the Choushin’s upper-dimensional power since they were operating in a lower dimension. This limiter could be removed in an emergency and since the limiter was removed at the end of OVA 3, it is unknown as to who is the most powerful. However, Tokimi is the Battlemaster of the Choushin, so she is presumably the most capable in combat. What is known of Washu’s past? We now have new, updated information on this, which you can read about here. Is Washu’s son, Mikumo, still alive? Not as far as we know. The son seen in the episode 8 flashback is dead as far as we know. Why did Washu create Ryoko? Washu was left at a monastery some 20,000-years ago as an infant with three gems. During that time, Washu’s goal was to learn more about the gems and find a way to harness their power. Ryoko was the result of this work. This is something Washu-sama (the Choushin Washu) had been doing for a long time (going back to the ancients — the pre-precursor civilization) in her attempt to prove the existence of a higher-powered kami. Would it be acceptable to think of ancient/prehistoric civilizations as “A civilization that was destroyed before the birth of the current culture (sentient lifeforms) in the Tenchi world, among the civilizations that have been born and disappeared in the long history since the creation of the universe”? At least at the Academy, civilizations that had gone beyond the stage of unmanned interstellar round-trip travel, but had regressed to a stage before interplanetary travel for some reason, are considered destroyed. This means that there are some circumstances where the sentient lifeforms themselves were not destroyed. The chronological definition of ‘prehistory’ varies depending on the area in which a particular culture existed. What is this Airai I hear about? Airai is a planet with the greatest concentration of precursor artifacts. By studying them, they have extremely advanced technology that makes them one of the greatest nations. Additionally, they are aware of the “Three Lives”, the Choushin. Airai is also the center of the largest religion in the galaxy and while they have powerful religious leaders, they are seeking a ‘true god’. They believe that Tsunami is one of the three great goddesses and are convinced that Jurai is selfishly keeping her to themselves. The Airaians thus plan to gain access to and ‘acquire’ Tsunami. The usage of overt force is not their chief method in this undertaking. Instead, they are using diplomatic and undercover methods. For example, Airi, the daughter of their leader, was to marry a member of the House Amaki of Jurai. By doing so, they hoped to someday have a Airaian on the throne of Jurai. Instead, Airi had a relationship with Yosho and broke off the engagement to the man from House Amaki. 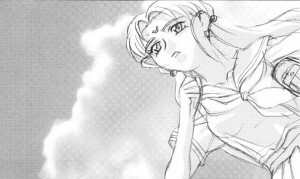 About 140 years later, she would marry Yosho and eventually give birth to Kiyone, the mother of Tenchi Masaki. The Juraians do not see Tsunami as a god to be worshipped, though they certainly regard her with a great deal of awe and respect. This is due to the contractual relationship that Tsunami has with Jurai (she would protect the Royal Family until Tenchi appeared). Thus, they have a partnership, rather than a religious connection. The partnering process involving the Royal Trees, offspring of the original Royal Tree (Tsunami-no-ki), also contributes to this viewpoint. What else is known about Tenchi’s grandmother, Airi-san? When Airi found out she was pregnant, she knew that the Airaians would have killed Yosho’s child had they known about it. Before she returned to Airai, she had the fetus removed and placed into stasis. She then returned to Airai, broke the engagement, and then returned to the Galaxy Academy. After defecting to the Academy, she had the fetus removed from stasis and placed back into her womb. She later gave birth to a daughter, whom she named Minaho. Seto-sama took Airi-san under her wings during this time, thus the two are very close as seen in GXP. So, the Airaians did not know that Airi had been pregnant with Yosho’s child. It’s also quite possible that her marriage to Yosho is still ‘secret’, not known to anyone outside Earth Masaki, Jurai’s Royal Family, and Airi’s circle of friends and confidants. So, this still might be a political bomb, both amongst some Juraians and the Airaians. Galaxy Academy used to be known as the Royal Academy. Why the name change and how is this school connected to Jurai when it was Royal Academy? The Imperial Academy (aka: Royal Academy) was founded on Jurai planets (named after Japanese universities, incidentally). Due the political tension between Jurai and Seniwa, various individuals such as Washuu were negatively impacted. Additionally, the Academy really couldn’t be a center of pure academic pursuit due to these political issues. So, various individuals, most notably Washuu, led the movement to make the Academy independent. They succeeded and the Imperial Academy became the Galaxy Academy, signifying that it was a neutral place of learning. The now independent Academy became a core part of what would lead to the founding of the Galaxy Union. What is the Galaxy Union? The Galaxy Union is basically like the United Nations, composed of various nations, of which Seniwa is the largest. Thus, in actuality, much of the Galaxy Police and Galaxy Army (the law enforcement and military arm, respectively) is actually composed of Seniwa’s forces. That is why the influence of the Kuramitsu family (Mihoshi’s family) is so great within the Galaxy Police and Galaxy Army. Jurai also participates/cooperates with the GA and GP, particulary in anti-pirate actions. However, as evident in TM!R OVA and TM!R GXP, Jurai does not fully trust the GA/GP, making it a point to prevent any other nation from gaining possession of an Imperial Tree of Jurai. Did Jurai play a part in founding Galaxy Police? To my knowledge, only in the sense that the former Imperial Academy was at the center of the Galaxy Union. How powerful can Ryoko be with the three gems? Based on the original fan translation of “101”, the original question #39 was translated to ask this question. However, True Sheol and Watotsu went to the Japanese source and discovered this was not quite accurate though it was addressed by Kajishima-sensei. 39) Q: What is the power of three collected jewels? A: Power is equal to Tsunami. When 3 jewels are all collected, what is Ryouko’s capability? In the end, Ryouko is still a being in the middle of development, that is. At that time Ryouko, power almost equal to Tsunami who can form 10 Light Hawk Wings will be able to utilize. In the 3rd episode Yousho was able to vanquish (seal) Ryouko, Ryouko is still an imperfect being so he was able to gain opportunity in the existing circumstance. In the 5th episode, Kagato spoke such words. So Ryouko, is a failed project as well I guess? Kajishima: “It is so. However, in a blank with those words of Kagato, the word “now” is inserted. Within Ryouko, the capability to evolve was given, so possibly someday the jewels’ full power could be drawn out when she reaches past some point. However, even now great power is possessed, if it achieves a perfect body, I wonder what it will be like……? Somewhat scary. 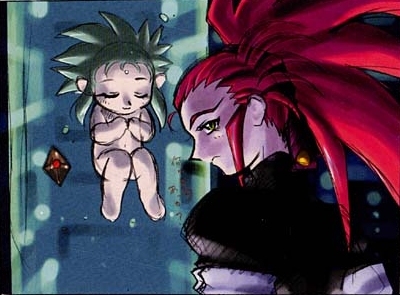 I’ve heard there’s an image of Ryoko as an infant. Is this true? Yep. See the image below. The image is from the Kajishima-sensei doujinshi Omaturi 4. Interestingly enough, this isn’t a Tenchi Muyo! doujinshi title, but an original story by Kajishima-sensei which has not been placed into anime format (that I’m aware of). The illustration was used by him to explain bioengineering that was a part of his story. When you click the image, you’ll notice that next to Ryoko there is a crystal. That would be Ryo-ohki being grown at the same time. Who is this “Tenko” I hear about? 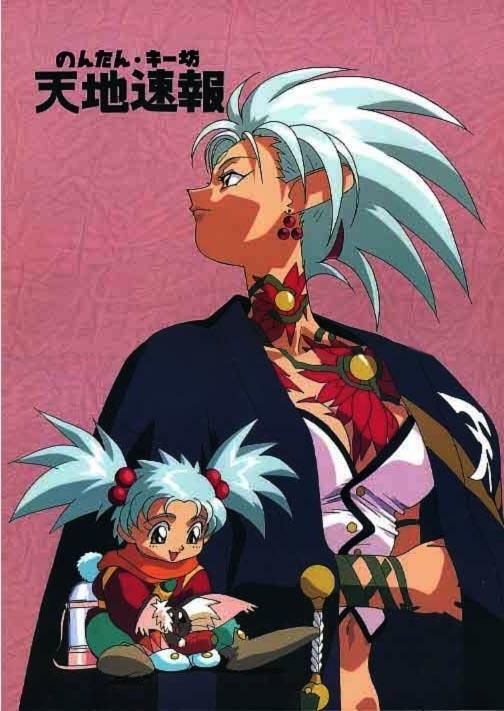 In the TV anime series Tenchi Universe, it was the name given to Tenchi when he was dressed as a female to avoid detection. This is Ryoko several decades later. In order for Tenchi to give the master key (Tenchi-ken) back to Yosho, the three gems were removed from the sword and returned to Ryoko. The girl is Ryoko’s daughter, and the one with her is not Ryo-ohki but rather her child. The daughters of Ryoko and Ryo-ohki went out into the mountains in the winter to pick Aeka’s favorite flowers for her birthday gift and went missing… This is a scene from that story. Because the girl does contain some of Tenchi’s features, fans dubbed the girl “Tenko”, combining Tenchi’s name with Ryoko’s. There has been some thought that Ryoko’s daughter referred to Aeka as “aunt,” however the term is not in the original text. We think the idea of Ryoko being called “aunt” originated from a Japanese fansite, but that’s unconfirmed. Based on how the Japanese people would properly address folks, it would be proper for Ryoko’s daughter to address Aeka as “Obasan” or “Aeka-obasan” which means “aunt” or “middle aged lady.” Knowing Ryoko, she could have taught her daughter to address Aeka as such, just to tweak her (it is a common joke for women approaching or at middle age to not want to be addressed as “obasan”). How did Tenchi’s mother Kiyone die? That is not currently known for sure. Episode 20 does indicate that she died of old age, but considering the script Nobuyuki and Yosho used to tell Tenchi the information (written by Kiyone) and the general bizarre way her death was treated, it is hard to know for sure if in fact this is true, or just another way for Kajishima-sensei to tweak the fans. Are there any other images of the children of Tenchi or the girls? Yes. The image at the left is from the doujinshi Omatsuri Zenjitsu no Yoru 21 Seiki-ban 1 (aka: 21st Century). 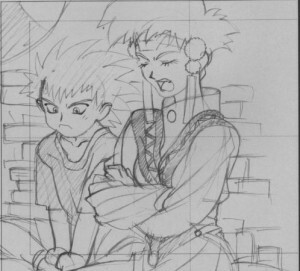 The boy on the left is Tenchi’s son, who remains unnamed though he does look a bit like Washu don’t you think? Some think he looks a bit like Ryoko. His mother is unknown to us at this time. The woman sitting next to him is Misaki, sister of the first Emperor of Jurai. She is still alive thanks to her Royal tree, and in this image, she is in her astral form. Tenchi’s son fled Jurai (where Tenchi and the girls are living at the time), doing something similar to what Misaki did over 150,000-years before — run away. He complains about his mother (NOT his sister as is widely thought among English-speaking Tenchi fans), and she complains about her oniichan (the first Emperor). The two have a lot in common and when the boy grows up, the two get married, after Tokimi gives Misaki a new body. Later at Washu’s behest, the two travel the galaxy as archeologist exploring historical ruins (assumed to be those of the precursor civilization or even the ancients). As to other images of the offspring of the girls or Tenchi, I’m not aware of any at present. However, should more pop up, I’ll be sure to include them here. I heard there is a picture of Sasami as a teenager on Earth. Is this true? Yep. This is from the 2005 doujinshi from Kajishima-sensei called Omatsuri Zenjitsu no Yoru – Omake. We think Sasami-chan is about 17 in this image. Tenchi and the girls are still living on Earth at this point (they all eventually move to Jurai) and apparently Sasami-chan goes to school in Japan. Please explain the differences between the passage of time on Earth and in the [rest of the] galaxy. Please think of the passage of galactic time as almost the same as (*)the passage of time on Earth.